With the recent events of September 11, 2001, New York City has come into the world spotlight as a city of courageous people. It’s a city known to many for its checkerboard pattern of densely trafficked streets, the bright lights of Broadway, the financial district of Wall Street, its elegant penthouses of Park Avenue, and the endless tenements of Harlem. William Kornblum shows his readers a different side of New York in his new book, At Sea in the City. Long before any of the above existed, there was New York’s watery side. The city’s five boroughs stretch over an archipelago of islands, crisscrossed by streams, rivers, tributaries and bays. For people like Kornblum, New York is shaped by the water surrounding and invading it. For them, the city’s waterways have brought riches, either through trade or piracy, and, more importantly, freedom. Kornblum, a New York City native and longtime sailor, has spent decades plying its waterways in his restored catboat, Tradition. This book is about his rambles up the East River, down tributaries, and around Manhattan to catch glimpses of the city that never sleeps. He sleeps on the water, eats on the water, and explores the hidden industrial waterways that have long-since been forgotten. While he sails, he interweaves the history of New York with his accounts of piloting a small sail boat in New York Harbor. He reveals mysteries and secrets of past events and tells stories of the men and women who made the waterways their own. Along the way, he lays bare the true character of New York. 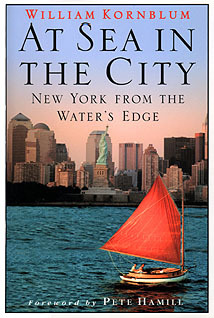 In this engrossing book–the kind a reader can’t put down–he takes his readers along as he sails through and around his hometown, retelling the history of the city’s waterfront and maritime culture and the stories of the men and women who made the water their own. This book is not only well written, but a joy to read. It makes the crowded streets of New York City disappear and its romantic waterways come to life. Anyone who loves sailing will love this book–and even those who have never sailed will find themselves totally captivated by its charm.